The beds were excellent! The views of the Agia Pelagia bay where a dream! The attention to detail and the feeling of being at home, with a great hostess ( she is always available yet not intrusive) & timely housekeeping! We were welcomed by the extremely charming host who took care of our last minute booking and our dinner, and by a bottle of wine in the fridge! 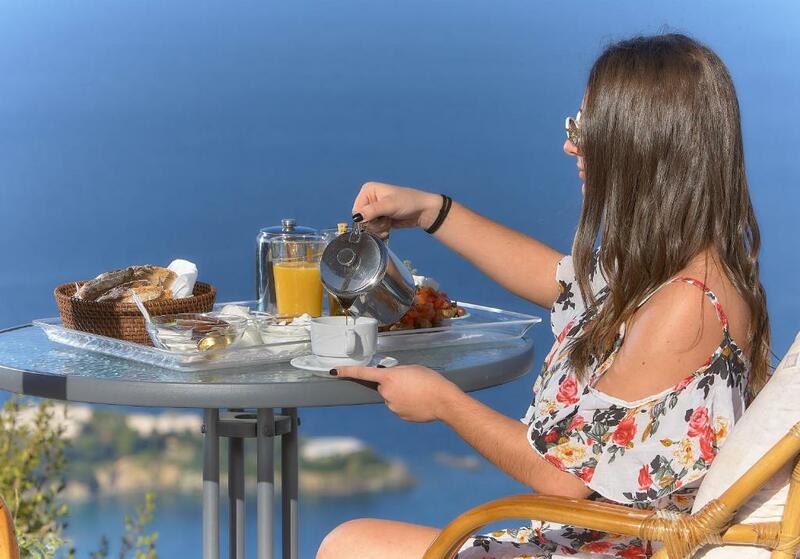 The view is breathtaking - even locals consider it one of the best on the island. Each room is well isolated and has its own terrace. Seem to be equally good for solitary travellers and for families with kids. The view from the apartment was absolutely outstanding! The cleanliness was also very good. It was a nice thought to give us some wine and fruit on arrival. We booked an appartment with a private pool. The view was fantastic, the appartment well equiped and the host was very friendly and always available. Herbs can be found in the garden and used for cooking. Breakfast is available upon request. We will definately come back to this nice Location. Fabulous views. Very private and extremely clean. Host very warm and welcoming. Pool was lovely and the mountain breeze meant it was always comfortable despite high summer temperatures. the view is superb. the swimming pool is lovely. the balcony is good. Lock in a great price for Nymphes Luxury Apartments – rated 8.6 by recent guests! Nymphes Luxury Apartments are 14 miles from the Heraklion airport, toward the middle of the island of Crete. 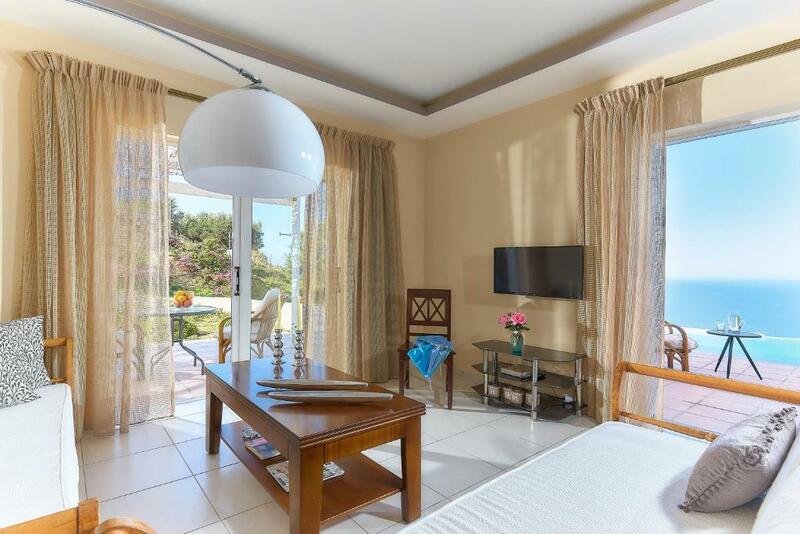 The hotel is 13 miles from Knossos Palace and just 12 miles from Heraklion Port. 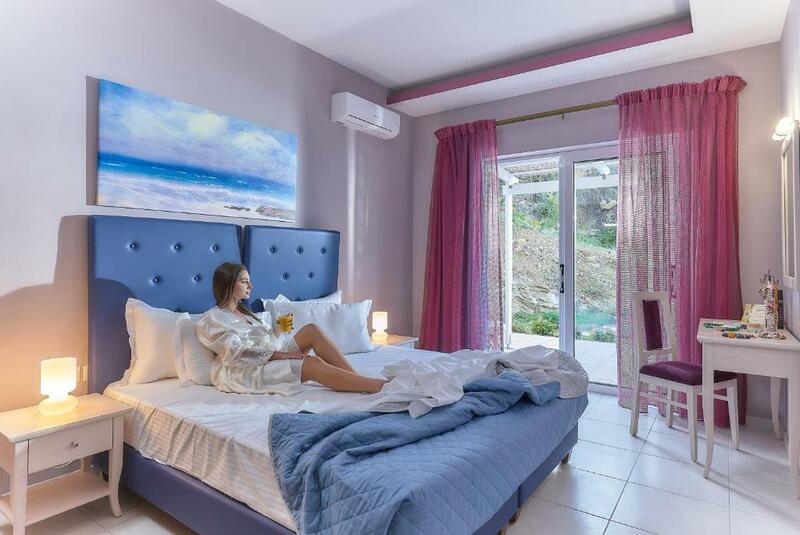 On an enchanting hill at Agia Pelagia, in an expansive area of natural beauty, Nymphes Luxury Apartments offer a complex of 10 accommodations with swimming pool. 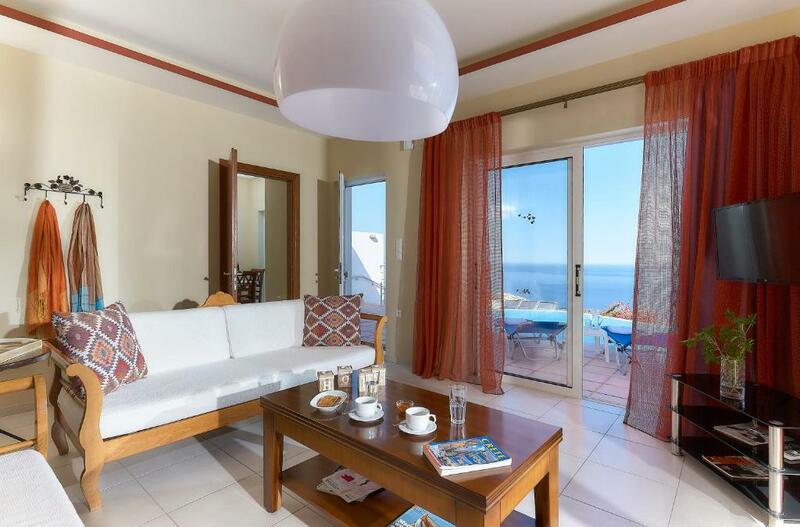 All accommodations offer a spectacular view of the blue Aegean Sea. The 4 studios and 6 apartments are beautifully decorated and equipped with handmade furniture. Each unit is equipped with free Wi-Fi, satellite TV and air conditioning. 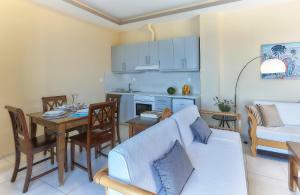 Nymphes Luxury Apartments have a central location on the island, and is an ideal base for exploration of the island. The hotel can arrange daily excursions as well as special tours and cruises to nearby islands. When would you like to stay at Nymphes Luxury Apartments? 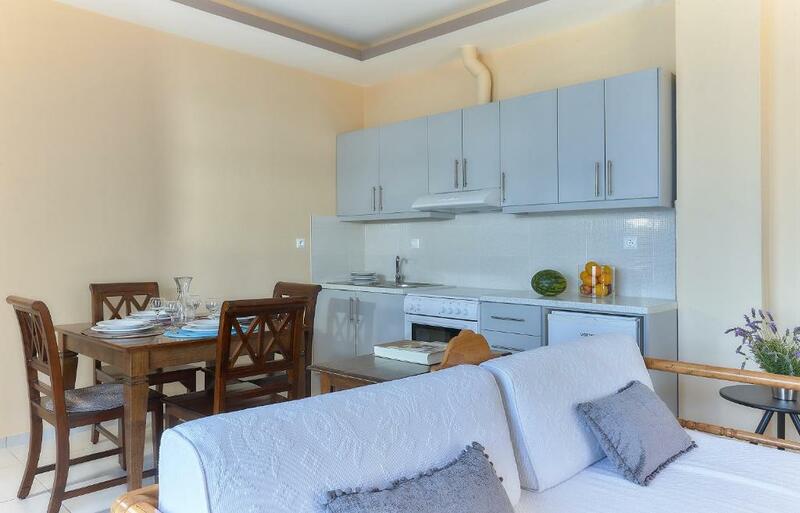 Apartments consist of a bedroom, a spacious living room and a kitchenette. 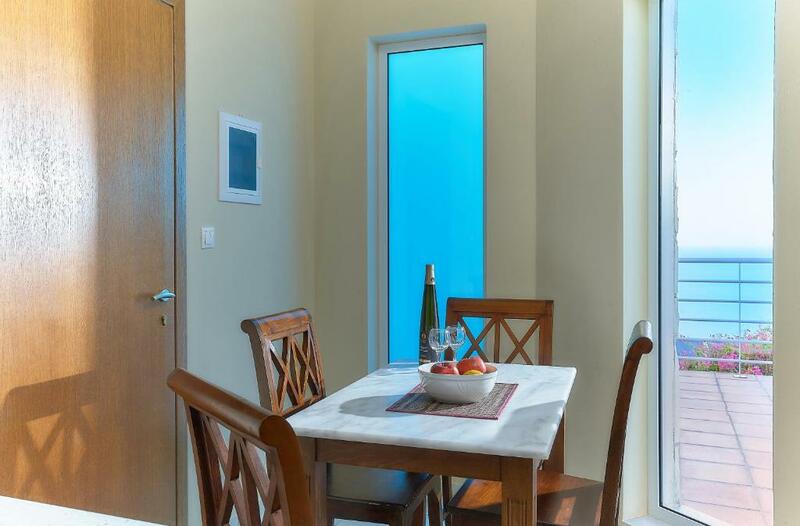 Studios are open plan and are located above the apartments, offering panoramic views. This apartment features a balcony, kitchenette and soundproofing. I, also, support my guests in their activities, lending a guid book in their language and inform them about where to go and what to sea. Winery visiting, sailing, scuba diving, bird watching, but also, I support for Plastic Surgery and dental works. I'm Pepy and, this year, I decided to offer my guests the experience of tasty Cretan cooking lessons, according to my mother’s recipes, using excellent quality local products. I, also, prepare “gluten free”, Vegeterian & Vegan breakfast. Agia Pelagia has developed around its shores, so that's where you'll find many of the taverns and cafeterias along the beach, a super market, tourism offices, pharmacy, an ATM, tourist and souvenir shops and the taxi stand. Agia Pelagia bay is protected from the wave-creating north winds, and the sea is almost always serene. There is no intense nightlife here. There are, of course, a good selection of bars and cafes to enjoy your favorite drink. and all have a beautiful view of the sea. The central beach of Agia Pelagia is sandy, with umbrellas and beach chairs, plus water sports and diving centers, which offer beginners' courses. The bay deepens relatively fast, but in the middle of the beach there is a long and narrow rocky plate, which provides a small area safe for children. Ligaria beach, east of Agia Pelagia. This one is also sandy, with umbrellas and several tavernas. The bay is smaller, but it is also protected from the north winds. Mononaftis beach, west of Agia Pelagia. This is a lovely small cove with umbrellas, restaurants and hotels, but it is not protected from the north winds. House Rules Nymphes Luxury Apartments takes special requests – add in the next step! Nymphes Luxury Apartments accepts these cards and reserves the right to temporarily hold an amount prior to arrival. Please inform Nymphes Luxury Apartments of your expected arrival time in advance. You can use the Special Requests box when booking, or contact the property directly using the contact details in your confirmation. The room was charming, and so was Pepy! The facilities were fine with everything provided for our stay. And the view was absolutely fabulous. The bed was extremely hard. The wifi did not work at all in the bedroom. It would have been nice if the basic essentials like- Coffee, tea, sugar, milk, salt and pepper and shampoo/conditioner could have been provided in the apartment. The property is starting to look a bit run down- an old car and other rather unattractive things left lying around. They have a beautiful German Shepard dog that is permanently caged in a very small area and appears to be extremely neglected. We did not see anyone go near it the whole time we were there and it was never let out of the enclosure. It walks around and around in circles all day- we all slept with ear plugs in as we could not stand listening to it cry and whimper all night. The dog should not be on the property- it was extremely upsetting to see it in this awful situation. The steps, but We loved our view so even they were worth it! The booking was confirmed, but when we arrived the gate was closed and no one was there. The telephone number was the wrong one, and we had to wait an hour and a half before we eventually got a room in the oterwise empty apartment complex. We were the first guest this season, and the mattress was cold and slightly moist - uncomfortable. The central heating was either not turned on, or out of order. No electric kettle. tv did not work.